Emerging from a framework of planks, an earthwork in straight lines reveals a planted and welcoming space. 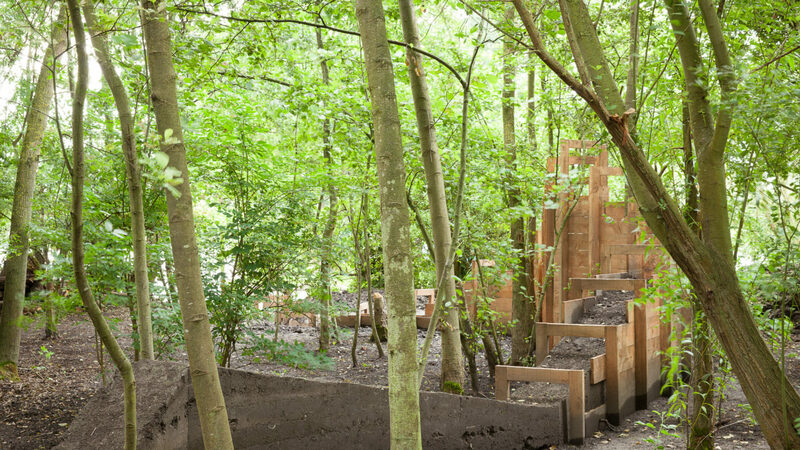 Designed by the Dérive collective, this garden highlights a process always at work in the Hortillonnages, that of erosion. What would happen if the archipelago of the gardened marshland lost its girdle of planks and willows? Without these traditional systems for strengthening and maintaining the banks, the domesticated land would return to its natural condition and the Hortillonnages would fall into the water. To provide a glimpse of this disappearance, the earth material is here shaped using a process traditionally called “ramming”. This technique consists in compacting earth between formwork panels which can be removed without drying time. The strength of this traditional construction method is here diminished in order to reveal the deterioration of the structure: water, wind, rain and sun, the rigid rampart slowly gives way under the implacable force of the marshland, colonising vegetation and the use of the place. Converted into seats, pathways and furniture, the wooden planks which acted as formwork constitute the unchanging feature of this arrangement, where they continue to evoke the original shape of an earth wall. The Dérive collective brings together landscape designers, set designers and architects: Amongst them, Pierre-Yves Péré, an architect, and James Bouquart, a landscape designer, work in Nantes and Tours respectively. Although they practise their professions separately, since 2006, the collective has allowed them to get together for more borderline projects, where they involve the individual in the construction of his living environment.